Hi friends!A beginner’s recipe that doesn’t need any expertise. Heat a kadhai / wok / or heavy bottom pan and dry roast the semolina for five -seven minutes on a low flame. Add the desiccated coconut , mix well and fry for 7-8 minutes more. Take out the lightly roasted mixture in a bowl. Heat one tbsp ghee in the same pan, add the cashew nuts and pistachios flakes fry till they turn light golden brown, add raisins fry for a minute .Remove and keep the fried fruit aside. Heat remaining ghee in a kadhai / wok / or heavy bottom pan and fry the roasted rava/ sooji / semolina coconut mixture for 7-8 minutes on medium -low flame. Boil 1/2 cup of milk in a pan add saffron, cardamom powder and sugar. Reduce the heat to low flame till the sugar gets dissolved completely switch off the stove. Add milk, sugar, saffron and cardamom mix to the fried rava / sooji / semolina coconut mixture. Stir it well add the fried dry fruit. Mix it well and switch off the stove. Cool it for ten -fifteen minutes. 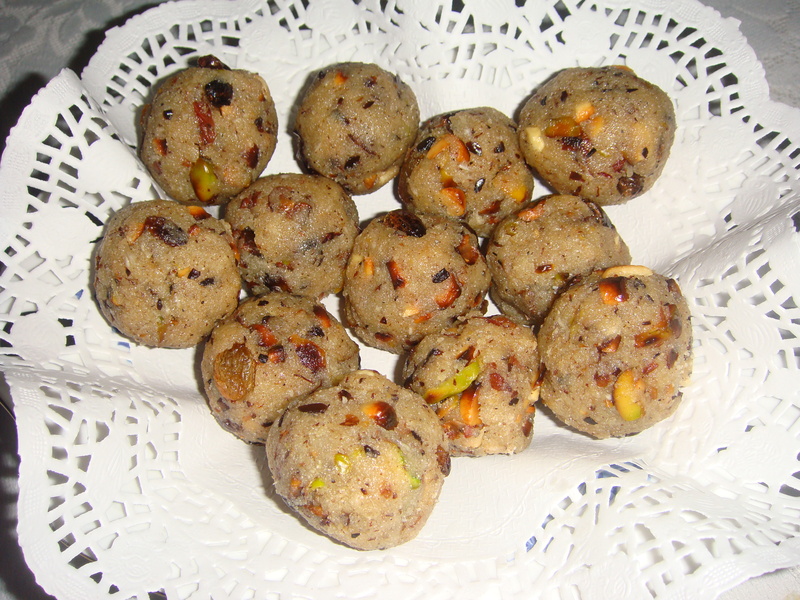 Take equal portion of the mixture and shape it in to laddus . You will get fifteen laddus. If you prefer a less sweeter version, add 2/3 cups of sugar instead of 1 cup.You can keep the laddus at room temperature for 3-4 days and in the refrigerator for a week. Wonderful! Something too good!! !very delicious. Out of this world! I can say only this much.